It was the big game against a fearsome crosstown rival, in her final season on the high school soccer team. And she was ready. When the ball came to her, she kicked it and just after her foot returned to the ground another player ran into her, tearing her anterior cruciate ligament. 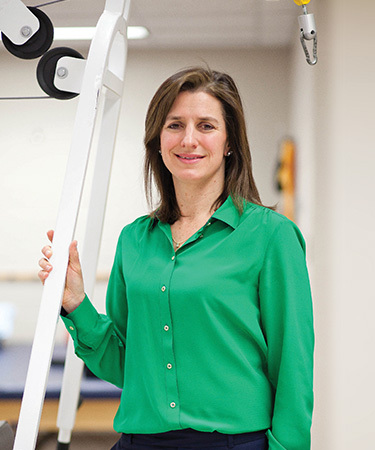 The injury landed Dr. Ann Dull ’08 in a physical therapist’s office—and inspired a lifelong passion. 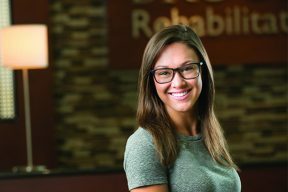 “Going through physical therapy gave me a better appreciation for the field—from the relationships I built to seeing how a physical therapist can get someone back on their feet,” she says. With a bachelor’s degree, she worked as a physical therapist at MidMichigan Medical Center. 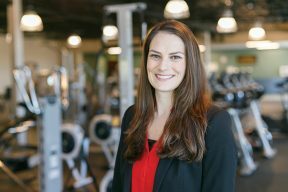 Initially, she focused on patients with neurological conditions, like an 18-year-old who was in a car accident. While he was in a coma, Dull took him through a range of passive motion exercises, talking to him to explain each one. When he woke, he remembered what she’d said. “It was such a rewarding experience,” she says. 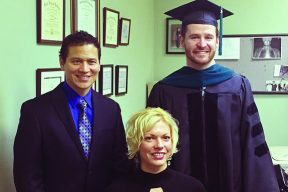 Although she’d been promoted to clinical supervisor, she felt there was more to learn, so she enrolled in the Transitional Doctor of Physical Therapy (tDPT) program.